1889. London Electric Supply Corporation, Deptford Generating Station. 1882 Left Siemens Brothers and Co. Formed Ferranti, Thompson and Ince Ltd to manufacture alternators under licence from Sir William Thomson (Thomson - later Lord Kelvin - had independently developed a similar alternator to Ferranti's concept at the same time). 1883 Ferranti, Thompson and Ince Ltd wound up at the end of the year. Sebastian bought back his own patents and set up a company called S. Z. de Ferranti Ltd in partnership with C. P. Sparks and others. c.1885 Brought in by the promoters to overhaul the Grosvenor Galley Electrical Lighting Co installation. 1887-90 Engineer to the London Electric Supply Corporation (LESCo). Designed and built the Deptford Generating Station, the first power station in the modern form, and installed 1000-kilowatt 10,000-volt alternators. This was the pioneer high-voltage underground cable transmission, and much was learnt concerning the peculiarities of alternating currents when transmitted over cables of considerable capacity. 1905 Ferranti company relaunched. S.Z. de Ferranti took less active role in the running of the company. 1912 Patent applied for Improvements in and relating to Electricity Meters. "THE LATE DR. S. Z. DE FERRANTI. The names of some men are written on the page of history by reason of their deeds, while those of others are recorded rather by reason of the influence they have exerted on their contemporaries or upon the thought of the time. There remain a few who have excelled both in performance and inspiration, who have been at once men of action and prophets. Among these there is no doubt that Dr. Sebastian Ziani de Ferranti, whose death, we regret to record, occurred at Zurich on Monday, January 13, must be numbered. His life and work fall naturally into two divisions. During the first, he acted as a pioneer of electrical generation on a large scale, facing the problems that always beset the practical development of any new idea, inventing new devices in great number and variety, and superintending the many details of a business concern. During the second, his energy, his foresight and his personal magnetism were devoted to stimulating and inspiring others, in order that they might employ their talents to bring, what he himself first called, the all-electric idea to fruition. No strict line of demarcation can, of course, be drawn between these two branches of his activities. It may, perhaps, be said, however, that it was during the first part of his working life that he was best known for his deeds, and during the last, that he was looked up to and venerated for the infectious enthusiasm with which he pointed out what should be the next objective in the march of electrical development and for the hints he gave as to how that objective might be attained. He was, above everything, a leader, and one of the main claims to fame of many of those who have since attained eminence in their profession is that they were “ old-Ferranti” men. It has been remarked that Ferranti was fortunate, since the successes of his life were achieved when he was still young. Nevertheless, it is doubtful whether he admitted the implications of that statement. Successes and failures, of which he also had his fair share, he regarded as incidents, pleasant or unpleasant as the case might be, and not as forces which could deflect him from his ultimate goal. He realised, too, that that ultimate goal would most surely be achieved by doing the thing next to hand; and this realisation not only suggested fresh problems on which he might work, and encourage others to work, but kept him as fresh and enthusiastic to the last, as he was when the conception of Deptford was gradually assuming a concrete form. Indeed, those who have heard him speak, as he frequently had occasion to do in recent years, must have been struck by the clarity with which he saw that there was no finality in the task of devising how electricity could be generated and used in the best possible way, and that the achievement of one summit along the pass would only disclose others remaining to be ascended. He had no illusions that the future would be without its difficulties, hut he felt that, given the will, there could be no doubt that the way would he won. Sebastian Ziani de Ferranti was born in Liverpool, on April 9, 1864. He was educated at Hampstead School, St. Augustine’s College, Ramsgate, and at University College, London, where he studied under Carey Foster and Sir Oliver Lodge. A change in his family circumstances brought his scholastic career to an early close, and he was only seventeen when he succeeded, after two previous attempts, in obtaining a position in the electrical works of Messrs. Siemens Brothers and Company at Charlton. Considering his future achievements, he doubtless found the workshop more congenial than the lecture room. Indeed, he himself said “ There [at Charlton] I really got what I wanted. I was surrounded by dynamos and everything electrical. I felt entirely happy.” Nevertheless, he did not fail to recognise that his want of theoretical training had been a drawback, and on one occasion remarked that he had only been prevented from inventing the induction motor and the tungsten filament lamp by the fact that he did not make the correct deduction from the results of certain experiments. Like many other boys, he experimented with model steam engines, and, though unable to read until the age of ten, compiled a scrap hook in which illustrations from Engineering and other papers were well arranged and classified. Though his idea for a magnetic engine proved an obvious failure, he succeeded in making a bichromate battery from which he supplied an arc lamp, while later on, he devised a dynamo which worked on the Paccinotti principle, and in 1882 took out his first patent for the machine, which was afterwards well known as the Ferranti alternator. The idea of using a zigzag winding, which was an essential feature of this machine, had, however, already occurred to Kelvin, with whom the young inventor entered into a manufacturing agreement. An alternator of this type was employed for lighting Cannon-street Station, and was described in Engineering for December 1, 1882. Its output was 156 amps, at 125 volts, and a frequency of 254, and it ran at 1,900 r.p.m. It weighed 76 lb. per kilowatt, and had an efficiency of about 86-5 per cent. He also devised two direct-current dynamos, one of which was a unipolar machine without a commutator, and worked on a principle which was subsequently utilised in his mercury meter. 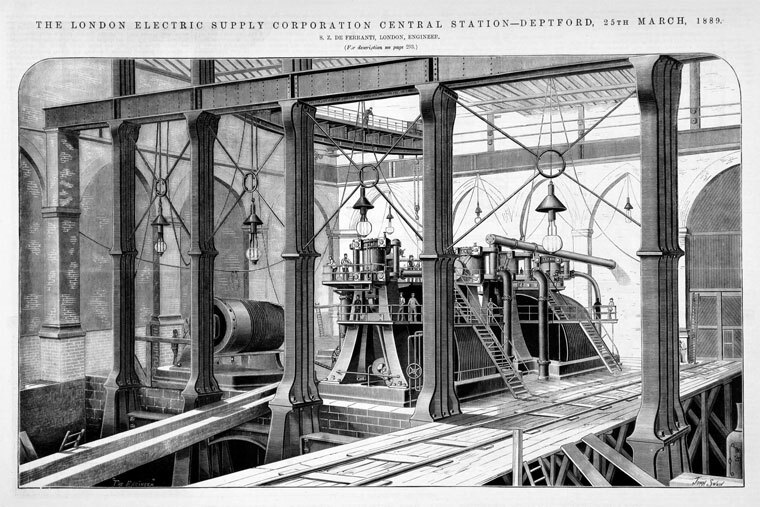 At this time it may be recalled that, though public electricity supply was greatly restricted by the provisions of the Electric lighting Act of 1882, some progress was being made, and one of Ferranti’s machines, with an output of 500 h.p., was installed under the Grosvenor Gallery in Bond-street to supply that building, and some of the surrounding premises. To enable this to be done on commercial lines, meters, motors and switches were all required, and were, in fact, designed by Ferranti as part of his ordinary work. Distribution was at first effected through Gaulard and Gibbs’ transformers working on the series system, but as this gave rise to difficulties he installed two 750-h.p. generators working at a pressure of 2,500 volts, and arranged the transformers to operate in parallel. In this way it was possible to give a supply through overhead lines over an area extending from Lincoln’s Inn Fields to Albert Gate, and from Regent’s Park to Charing Cross. Even in those early days, however, generating stations in crowded areas were regarded as public nuisances, and Ferranti himself realised that the arrangement was wrong in principle. On the contrary, he perceived that the proper place to erect such plant was on a cheap, if remote site, where supplies of coal and water could be obtained without difficulty, and that it should be used to supply as large an area as possible through high-tension feeders. The immediate result was a scheme for the erection of a station at Deptford, work on which was begun in April, 1888. This station was designed to have an initial capacity of 13,000 h.p., and an ultimate capacity of 65,000 h.p. The first machines were to.have an output of 2,000 h.p., but two others with an output of 10,000 h.p. were designed. Both the conception and realisation of this station were Ferranti’s own. He planned everything from the foundations to the chimney stacks, and superintended the carrying out of the work. Unfortunately for him, and for the prospects of the electrical industry, this ambitious scheme was wrecked by the parochialism of the Electric Lighting Act of 1888, under which the area assigned to the London Electric Corporation, of which he was chief engineer, was drastically curtailed. Nevertheless, Deptford was started and brought in its train a number of problems, which fully occupied his attention. Among the more important of these was the design of a cable, which could be worked at 10,000 volts, a value which he chose, as a good round figure for his main transmission voltage. The chief difficulties were not only want of knowledge and experience, but lack of satisfactory insulating materials. As might be expected, cables made according to the best practice of the day were continually breaking down, and once only one was left in working order between Deptford and London, and that could only be operated at half its normal pressure. The desperate expedient was tried of using an earth return, but this led to such disorder among the Post Office and railway telegraph lines, and such rumours of magnetic storms that it had to be abandoned. Finally, concentric tubes of copper, separated by brown paper soaked in ozokerite wax, were used, the cable thus formed being made in 20-ft. lengths. In spite of the numerous joints that were necessary this design proved successful, and it was only a few years ago that the last length was taken out. The provision of switchgear suitable for dealing with a pressure of 10,000 volts also proved a matter of difficulty to the designer and of danger , to the user. Many amusing tales are told of the expedients adopted for extinguishing the arcs, which occurred when the circuits were opened, but less pleasant to relate is the fact that a short-circuit on the switchboard at the Grosvenor Gallery caused the whole system to be shut down for some three months. This incident not only had a harmful effect on the fortunes of the company, hut discouraged others from adopting Ferranti’s ideas. It would be interesting, if unprofitable, to speculate on the course of events if success rather than partial failure had then attended his efforts. During what may be called the Deptford period Ferranti acted not only as a supply engineer, but as a manufacturer. As early as 1883 he had formed the firm of S. Z. de Ferranti and Company, with works in Charterhouse-square, and after 1892, in which year he resigned his position with the London Electric Supply Corporation, he devoted himself solely to this concern, a factory being soon afterwards established at Hollinwood, Lancashire, where the headquarters of the firm which bears his name are still situated. Naturally, his main activities were in connection with the manufacture of plant for the generation of electricity. Though the construction of the 10,000-h.p. alternators, which he had designed for Deptford, was not proceeded with, in 1895 he built a 2,000-h.p. set for that station, consisting of a compound vertical engine with cranks set at 120 deg., and generating current at 10,000 volts. He also designed a rectifier, which was made up of a synchronous motor driving a simple form of commutator for feeding circuits of arc lamps arranged in series, while among the other numerous inventions, which belong to this and to the earlier period, mention may be made of a steam engine and steam valve, high speed cotton machinery, an electrolytic lighting arrester for overhead lines, an induction furnace (the ideas embodied in which were afterwards developed by Kjellin), and the mercury meter, which is still one of the staple and most successful products of his firm. The steam turbine had now entered the field of electricity supply as a formidable, and subsequently successful, rival of the reciprocating engine. It is not surprising, therefore, that for a number of years Ferranti devoted himself to what turned out to be not altogether productive investigations into ways of improving this machine, or that he especially considered the possibility of employing steam at temperatures higher than those which had then been used. He also developed electric welding for fixing the blading and made some experiments into the possibility of constructing a steam-gas turbine, in which steam was employed in a gaseous state at a high temperature throughout the working cycle. In spite of these activities this period must be considered as being the least, interesting in Ferranti’s career. He was working hard and, as ever, with enthusiasm, but the useful results obtained were meagre, and he was not much in the public eye. So much was this the case that when he was elected President of the Institution of Electrical Engineers in 1910, many foreign engineers were surprised to learn that he was still alive. That address, however, strikingly proved the contrary, and may be said to mark an epoch, not only in his own life, but in the history of electricity supply. He began by pointing out the need for the better conservation of our fuel resources, of supplying our own food requirements, and of making greater use of the labour at our command. In considering the first question he said that he had been forced to the conclusion that the only solution of the conservation problem was to convert the whole of the coal needed for heat and power into electricity at a comparatively small number of large generating stations. This, however, could only be effective if the conversion was carried out in such a . way that the electricity represented about 25 per cent, of the energy in the coal. He suggested the erection of 100 stations, each containing ten 25,000-kw. generators. The scheme was worked out in considerable detail, and it was estimated that, if it were adopted, the total cost of generation need not exceed O-lrf. per kilowatt-hour. He summarised the advantages which could be obtained by the greater use of electricity for traction, power, heating and domestic purposes, and, reviewing the whole position, said that for whatever purpose coal and gas were then used, electricity would.show it was a better medium. Finally, he prophesied that the all-electric idea would become an accomplished fact in the near future. It cannot be said that this address was received with universal approbation. As is always the case, there were some who regarded the ideas put forward as impossible of realisation. There were others, while admitting the prevision shown, thought that the obstacles were so numerous as to remove it entirely from practical politics. Nevertheless, time has proved the correctness of his ideas, and the national scheme, which is now being worked out, is nothing more than an embodiment of what Ferranti suggested—not only in the Address from which we have quoted, but long ago in that great conception at Deptford, which will always remain a fitting monument to his memory. It is generally recognised, however, that concentration of generation is not the only factor in making a supply of electricity generally available. Distribution offers its own-problems, and even more difficult is the task of manufacturing the necessary apparatus at such a cost as will render it possible for the humblest consumer to benefit from employment. It is not surprising, therefore, that during the last few years Ferranti, as a practical' prophet, turned his attention to this question. He installed apparatus in his own homes at Grindle-ford and Deganwy, which enabled all the domestic tasks to be carried out electrically and put the experience thus gained freely at the disposal of all who were interested. By his enthusiasm he did much to stimulate the development of electricity in the home, and offered his help freely to such bodies as the British Electrical Development and Women’s Electrical Associations. That electricity is a cure for many of our present-day difficulties was the underlying theme of the many addresses and speeches he delivered, and, promulgated by one who had earned such universal respect, there is no doubt that they often provided a much-needed stimulation to the easily discouraged. When a man who has overcome great difficulties points out how difficulties are there to be overcome he is not only assured of listeners, but there is a good chance that what he says will be converted into deeds. In Ferranti, therefore, the British electrical industry has lost a leader, who will be sorely missed as a genial and charming personality and whom it will be difficult to replace. Mr. Ferranti became a member of the ’Institution of Electrical Engineers in 1891, and served as president in 1910 and 1911. He was awarded the Faraday Medal of that body in 1924, and was elected an honorary member in 1925. He was admitted into the Royal Society in 1927, and- was also a member of the Institutions of Civil and Mechanical Engineers. He received the honorary degree of Doctor of Science from Manchester University in 1911." Dr. SEBASTIAN ZIANI DE FERRANTI, one of the great pioneers of electrical engineering, died at Zurich on 13th January 1930. He commenced his career in 1880 at the early age of 16 as assistant in the electric light department of Messrs. Siemens Brothers and Company, and afterwards had charge of the electric furnace experiments of the late Sir William Siemens at King's College, London. In 1882 he was appointed engineer to Messrs. Ferranti, Thompson and Ince, electrical engineers, and in the following year he was appointed to a similar position for the Hammond Electric Light Company. In 1886 he became engineer to Sir Coutts Lindsay and Company for the design and erection of the electric supply station at Grosvenor Gallery and was responsible for the building of much of the machinery and the running of the public supply of power from the station. In the following year the London Electric Supply Company succeeded the Grosvenor Gallery undertaking and Dr. Ferranti carried through his famous Deptford experiment, demonstrating the practicability of electric supply at 10,000 volts pressure. He carried out the reconstruction of the alternators and switch-gear at the Bankside Station of the City of London Electric Company, and also designed and manufactured a large portion of the plant for the Deptford station. Three years later, in 1890, he became engineer to the firm of electrical manufacturers bearing his name, and whose activities he had continued to direct since that time. Dr. Ferranti was born at Liverpool in 1864 and received his technical education at University College, London. From 1882 to 1927 no less than 176 patents were taken out by him, only five being in conjunction with another patentee. In 1911 the honorary degree of Doctor of Science was conferred upon him by the Manchester University, and he was elected a Fellow of the Royal Society in 1927. He became a Member of the Institution in 1900. In 1910 and 1911 he was elected President of the Institution of Electrical Engineers, and in 1924 he was awarded the Faraday Medal. A biography was written by Ferranti's widow, Gertrude Ziani de Ferranti and Ferranti's brother-in-law, Richard B. Ince, and published in 1934 . Family, business, and technical matters are given equal emphasis is given in the book. His parents were César de Ferranti and Juliana Scott, who were married at St George's Church, Liverpool, on 4 November 1860. Juliana was the daughter of painter William Scott. A curious aspect of the book concerns the lengths that the publisher went to include facsimiles of some of Ferranti's original letters, even reproducing embossed letterheads. His letters reveal interesting facets of his life and work. For example, we learn that the origin of the Ferranti alternator (patented 1882) is to be found in an invention which he was working on when he was 14. He wrote to his father in 1878: 'If I go to London in the Christmas holidays I shall get the casting (notice that it is only one and very simple) made for this machine.' A week later he wrote to his mother, describing the machine in more detail. An extract: 'The sub-prefect, who teaches Physics, says that he thinks it will work work very well. It would have to be cast in about 50 pieces of steel and bars, and about 40 of glass. I think it would cost me about £2. We learn that Ferranti was shown how to use a lathe by Father Augustine at a monastery school in Canterbury. In 1881, age 17, he invented his first alternator, which was made at the workshop of Mr A. J. Jarman, Richmond Street, London. This ended up in possession of the Science Museum. A patent for the machine was taken out in July 1882 by Ferranti and Alfred Thompson. In 1881 Thompson advised Ferranti to consult a lawyer friend, Francis Ince, who was very interested in the study of electricity. Ince advised Ferranti to leave the employ of Siemens, and start on his own account, offering to deal with his concerns about lack of capital. Following this meeting, Ferranti's invention of the zigzag armature was taken in hand by Alfred Thompson and Francis Ince, and the company Ferranti, Thompson and Ince Ltd was formed. It was found that the machine was very similar to that invented by Sir William Thomson, and an agreement was reached to pay Thomson an annual royalty, and the machine was to be known as the Thomson and Ferranti alternator. In 1886 Ferranti was appointed as Engineer to the Grosvenor Gallery Co., where he installed plant of his own design, including two 700 HP alternators. SEBASTIAN ZIANI DE FERRANTI, D.Sc, F.R.S., was born at Liverpool on the 9th April, 1864, and died at Zurich on the 13th January, 1930. He was educated at St. Augustine's College, Ramsgate, and for a short time he attended evening classes at University College, London, but his scientific knowledge was a matter of self-education, by reading books, by studying what others had done and by making his own experiments. His scientific bent was shown early in life; before he went to school he had constructed a battery and produced an arc light, and when he was at Ramsgate in 1878 at the age of 14 he constructed a dynamo. After he left college he had some small experience on the staff of Siemens Brothers and Co., but in 1882 he started in business for himself with Alfred Thomson and F. Ince as his partners, the latter being a solicitor by profession. This combination was formed to exploit the "Ferranti dynamo," a machine with flat coils having no iron in their cores, these being mounted on a hub and revolving between the poles of a ring of electromagnets. The magnets were relatively more powerful than those of its progenitor, the Siemens flat-coil alternator; the revolving coils were fixed to the supporting hub by a highly efficient mechanical method, and the disc thus formed was dynamically stiffened by its rotation. It achieved an instant success, having an output for its size greatly in advance of that of existing machines, but legislation had shut out all possibility of financing public supply undertakings, and other business was limited. Thus the new partnership was not successful, and after a period Ferranti started in business independently, being financed by Mr. Francis Ince. He turned his attention to the metering of electricity, and it was this that brought him in contact with the Grosvenor Gallery Electric Supply Corporation formed by Sir Coutts Lindsay and others to supply the Grosvenor Gallery and neighbourhood with electric light, using overhead mains. Ferranti had seen the Gaulard and Gibbs series transformer system which was at work at the Grosvenor Gallery installation, and he had also seen the Zipernowski transformers which were worked in parallel. He had made small transformers of a greatly improved mechanical construction, and had used them across constant-potential mains; thus when he learned of the trouble then being experienced with the regulation of the lamp pressure on the Gaulard-Gibbs system he was able to convince the directors of the Grosvenor Gallery of the superior advantages of his own system - comprising dynamo, transformer and meter - and at the age of 22 he was appointed engineer to the company. The success of the system which he installed decided the directors to put in hand the electrification of London, for which purpose Ferranti proposed to use the marine type of engine, which was known to work economically for long periods without stoppage. As it was then believed that alternators could not be run in parallel, units of 10 000 h.p. were decided upon, plans for a great central station at Deptford were completed, and construction was commenced. But meantime (1888) Parliament had revised the Electric Lighting Acts, and applications for provisional orders were made by various groups. The Board of Trade allotted so small an area to the Deptford undertaking that the construction of these large sets was stopped and smaller sets were installed. The plans for this central station were at the time entirely novel and opposed to all the existing ideas of other engineers, who sought to put the generating station as near the centre of the area to be supplied as possible. Ferranti conceived and put into operation the main principles on which all modern generation of electricity by steam power is based, viz. large generating stations near to ample supplies of cooling water, with facilities for bringing coal and removing ashes by water transport. Transmission to the point to be supplied was by means of high-pressure alternating current and transformers using high-pressure cables with impregnated paper insulation. After the completion and putting into operation of this generating station, Ferranti returned to electrical manufacturing, producing transformers, meters, rectifiers for arc-lamp lighting, oil breaker switches or fuses, and finally direct-driven steam generator sets. His modifications of the marine type of engine in which he endeavoured to improve the steam distribution by using slide valves moved by cams instead of eccentrics was not successful. Ferranti joined the Institution as a Member in 1891, and in the early days took part in the discussions at the meetings fairly frequently. 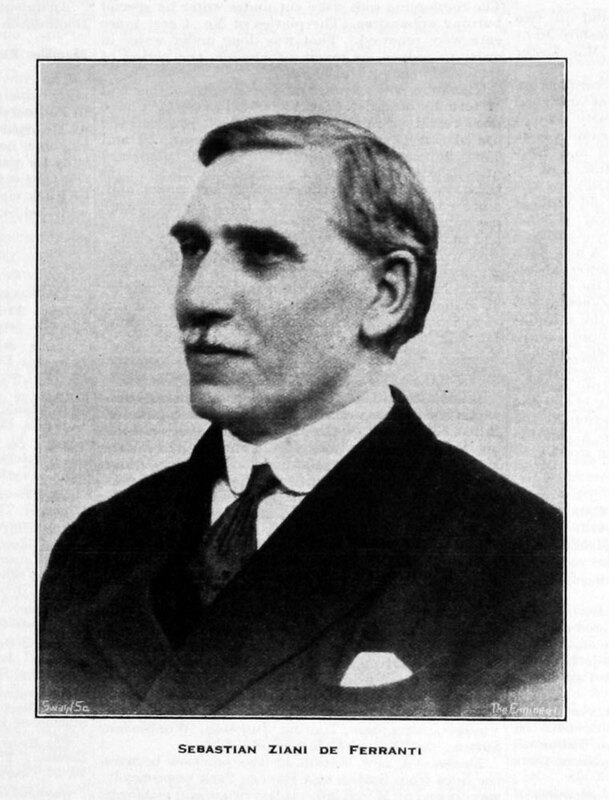 He became a Member of Council in 1895 and President in 1910 and 1911. 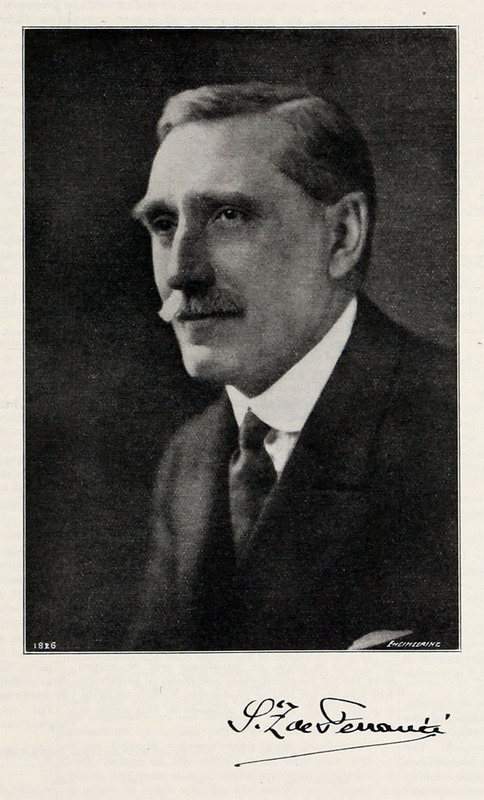 He was elected an Honorary Member in 1925. His presidential address was a new starting point for the electrical industry. He urged the universal application of electricity for all services. Lighting, heating, motive power on every scale and for every purpose - whether domestic, factory or transport - was all to be electrical. He stressed the possibility of cheap supply under these conditions. From that date onwards, interrupted only by the War period, he pressed this ideal, and his reasoned argument, his enthusiasm in the propaganda, and the practical example which he set in his own home and elsewhere have been great factors in the remarkable expansion of the use of electricity since the War. His last appearance at the Institution was on the 19th December, 1929, less than a month before his death, when he opened the discussion on Mr. T. G. N. Haldane's paper on an electrical heat pump. He will always be remembered in electrical work for these two great achievements, the production and transmission of electrical energy at high pressure and its distribution at low pressure, and the universal use of electricity for all purposes. Ferranti's activities were not confined to electrical work, for from 1895 onwards he worked on the gas turbine. He started his work with a patent for a combination of turbine, compressors and regenerators, working on the Carnot cycle, that is adiabatic compression and expansion—heat being taken in and given out by the working fluid (gas or steam) at constant pressure. He gradually realized, however, that this cycle - though theoretically the most efficient - leads to a small output from a given size of machine, and in 1902 he took out a patent for working on an isothermal expansion cycle, heat being supplied at stages during the expansion by the use of super- heaters. This procedure has become standard practice in steam turbine work. Further, he developed the idea of abstracting some of the steam at successive stages for the purpose of raising the temperatures of the feed water to the temperature of the boiler, realizing that steam so abstracted after it had done some work was really operating at 100 per cent efficiency. This procedure again has passed into general practice. These studies and experimental work were preliminaries, so to speak, to work on the gas turbine, but enabled a great increase in efficiency to be realized, some particulars of which he gave in his presidential address already referred to, and also at the World Power Conference in 1924. He was eventually able to realize his project of burning gas at high pressure and temperature and expanding it through nozzles until it was cool enough to come in contact with the blades of the turbine, being still nearly red hot. But this cycle of operations calls for compression of the fuel gas and the air for combustion to the operating pressure, and even if liquid fuel is used the air has still to be compressed. The power required to do this, even with the most efficient types of pump, absorbs so large a part of the output of the turbine that the machine as a whole becomes un- economic. From 1906 to 1930 Ferranti was occupied with the problem of increasing the speed of production and the quality of spun textile yarns. The process of twisting threads which had already been combed parallel was originally carried out by hand with the aid of a spinning wheel. It had been mechanized in two types, discontinuous spinning, that is a certain length at a time, by Hargreaves and Crompton, and the continuous process by Arkwright. The latter process enabled high speeds to be aimed at, but the limit had been reached due to unbalanced revolving parts, centrifugal forces acting on the thread as it was spun round at the bobbin, and irregular speeds owing to slipping of the bobbin driving bands. With his great power of analysis of a problem, and his equally great synthetic power—enabling him to integrate a new process leading from the same beginning to the same end - Ferranti removed the obstacles and greatly increased the speed of production, obtaining at the same time superior qualities of spun or twisted yarn. These experiments were still being carried out at the date of his death, and time only will show whether his new technique of this mechanical operation is a complete solution. Ferranti's retiring nature and modesty as to his own work were responsible for the slow recognition, except in specialist circles, of what he had done. He received the honorary degree of Doctor of Science of the University of Manchester in 1911; in 1924 he received the Faraday Medal of the Institution; and in 1927 he was elected a Fellow of the Royal Society. Ferranti married in 1888 Gertrude Ruth, second daughter of the late Mr. Francis Ince, whom he first met in 1882 at her father's house in Hampstead. He had three sons and four daughters. This page was last edited on 30 April 2018, at 08:05.